You have heard of Google Places, Yahoo Local, Bing Places and Yelp.com and you know that these are places where people can find your business online, and even leave reviews about your products and services. But, did you know how your small business is listed on these sites can affect how your website ranks in Google? Yep! Local citations affect a small businesses search engine optimization (SEO)! Wait, what is a citation? A citation is any mention of your business online. A citation can include any combination of your company’s name, address, and phone number (NAP), your business hours, and category keywords related to your business. Citations can either be structured or unstructured, do not always include a link back to your company’s website, and the information listed is not always correct. A structured citation is a mention of your business’s NAP on a traditional directory, such as Yelp.com, which offers business information alongside customer reviews. Unstructured citations are mentions of your business’s NAP on a website that is not a traditional directory, such as a newspaper article or blog. How do citations effect my Local SEO? One of the hundreds of ranking factors that Google considers is the consistency of a business across multiple channels online. In other words, Google looks at the business information you have listed on your website and compares that information with your citations to determine whether or not your website is a reliable source of information. If Google finds multiple of your citations with the wrong phone number, a different address, or even a different variation of your business name, your website will be flagged as untrustworthy and you won’t rank as high in Google’s local search results. Google can’t really be that picky…. right? Two local citations of a fictitious business are listed below. Can you spot the differences between the two? Google can! Variations as simple as what you see below are considered inconsistencies, and Google will not favor this company in its rankings. A business’s citations need to be identical to the information listed on its website. Make sure you have the correct information of your business listed on your website. 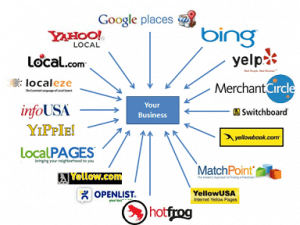 This is the starting point for search engines to evaluate your business presence online. Next, Google your business! You do not know what information about you is out there unless you look for it. If you find there are inconsistencies in your company’s citations, call the Local SEO experts here at Local Search Titan to discuss how we can get started unifying your business’s presence online.